Welcome to episode 54 of The Blogger Genius Podcast. Today I’m talking with Coley Arnold and Lindsey Holt, founders of Junk in the Trunk Vintage Market. We talk about how social media can build your business. 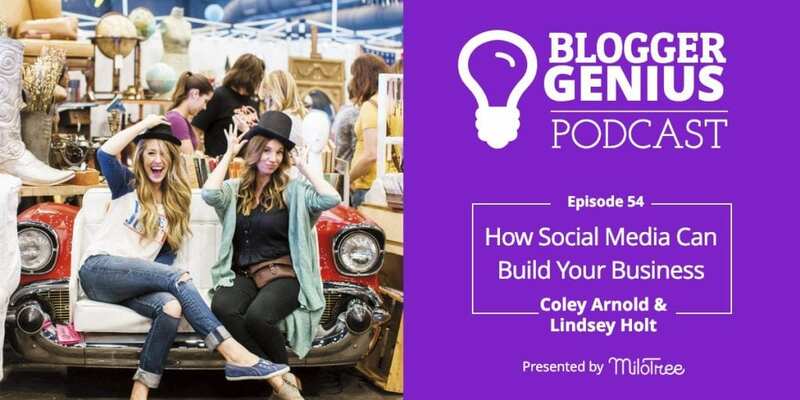 Coley and Lindsey, both vintage collectors, stumbled into starting a vintage market event business, and built it with social media, word of mouth, and a lot of guts! We talk about how they got started, what it’s like working as a team, how important Instagram has been for them, and why they built a supportive community of like-minded female entrepreneurs. If you love design, vintage, and entrepreneurship, you’ll love this episode! Hey everybody, welcome back to The Blogger Genius Podcast. Before I get into today’s episode, I wanted to share that we just rolled out a new popup for Shopify store owners. The way it works is, it pops up on your blog and it says, “Shop My Store” and it is populated automatically with your most recent products. It’s part of your subscription to MiloTree, so not only can you grow your Instagram followers, Pinterest, Facebook, YouTube, your email list, but now you can direct people from your blog directly to your store. I’m really excited about this. We’ve gotten some great early traction. If you have a Shopify store, please try it out and let me know what you think. Email me at Jillian@milotree.com. We just want to make it better, easier. We want to help get you sales. Okay, for today’s episode, I am interviewing Coley Arnold and Lindsey Holt. They are two friends and they accidentally started a business called Junk in the Trunk Vintage Market. They both loved vintage goods, and they started selling them. And they’ve, again, found traction and they turned it into a really cool business. Instagram is a big part of their success. You’re just going to hear their passion and how they grew this organically and what it’s like to work with one of their husbands. So without further ado, I bring you Coley and Lindsay. So Coley and Lindsey, welcome to the show. So as we were just talking about, I found you guys because you use MiloTree to grow your Instagram, it looks like. I don’t know if you’re using it for other social platforms. But your social media person reached out to me because she had a question about it, and I went to look to make sure it was working. So would you share what Junk in the Trunk Vintage Market is all about and how you guys started it, that kind of thing? What is Junk in the Trunk Vintage Market and how did you start it? Sure. This is the best accidental business that we didn’t mean to start. But, gosh, in 2011, Lindsey and I had met at a church group. We were both on the leadership team of a young marrieds class and our husbands became friends and we became friends. And the antique portion of it was mostly because we were totally poor and we’re like, how do we decorate a house and a nursery with items that we find on the curb or out of a dumpster? So we kind of bonded over that. Oh wait, say that again? …sold it to friends and through Craigslist. I sold painted furniture off of Craigslist. So our husbands were like, “Listen, the garages need to be cleared,” which by the way, never happened. They’re just getting worse. So we kind threw together this little market. We contacted some of our friends and some people that we had known and met on Craigslist as sellers on Etsy. And we did a little popup backyard market thinking it would just kind of clear stuff. The police came and tried to shut us down because we had so many people in my friend’s backyard. Two miles worth of cars. We did a central check out and Lindsay was I think… how pregnant were you? You were? I was due in two months. So we did. We figured it out. So it just worked. So what was interesting is you had a problem, which is you both had these crowded garages, and you went to solve your problem and you started a business. Yeah. So this is our eighth year and we brought Kevin on. So Lindsey’s husband is now full-time with us too, like three years ago, I think. I think almost four years. Four years ago, yeah. Crazy. So now there’s three of us that run it together. And what you do is you set up these vintage markets in different cities, different times of the year. Yeah, they’re basically like a giant antique event that we set up and we get, depending on our events, between 100 and 200 vendors that come and set up their amazing booths of all their stuff. Then we have live music and food trucks. It’s just a really fun event for like to bring your whole family out to. That’s so cool. Do you charge the vendors? Like, how do you make money? We do. So the vendors pay a flat fee for a booth space, which is just a kind of a small fee and then that basically pays for like the production of the show. I think a lot of people don’t realize how expensive putting on events is. So the things that you don’t think about of — insurance and fencing and bathrooms and all the not-fun things that no one sees are usually the most expensive, of course. Even just the building, a place to host it is a huge expense. Then we all charge at the gate for admission. We found that our shoppers are really connect with, you know, if they’re willing to spend a little bit of money to get in — and our tickets are start at $8, they’re not expensive. But we get quality shoppers and we get women and men who are in there that want to purchase something. They’re not going to just walk around to go, “Oh, that was nice.” Like, they’re on a mission. They’re there to find something. So it’s really beneficial to our vendors as well. That’s great. Now, what cities? We were talking you started in Arizona. Yeah, we’re in Scottsdale. So we do two markets in Scottsdale a year. And then we have expanded to San Diego, Pomona, which is the greater LA area, and Northern California. This last summer, we were in Richmond in the Northern California area. I think we’re going to move this summer. So we’re still working on that, but somewhere in the North Cal area. So you do how many of these a year? Five. So right now, five. Last year, we did like a popup holiday market as well. So we did six last year. But five is our normal. And I’m actually going to have another child. We talked about expanding and I was like, “Well, that would be great except for I’m having a baby. We’re going to do that. A little hold on the expanding for next year, but we’ll get there. How long does it take to plan an event start to finish? Wow. And how long does it take to plan one of these events from start to finish? To set up like an event? Gosh. So it depends. Our Scottsdale markets because we’ve been here for so long, we’ve been eight years here, are obviously our biggest ones. So we rent the building starting on Tuesday. So we load all of our equipment and everything on Monday, and then we move into the building on Tuesday. We are there basically 24/7 from Tuesday to Sunday. And we’re usually finished on Sunday at like 1 in the morning. Yes. The middle of the night. It’s a long week. So that one takes a whole week. And then our California ones, we’re usually there between Wednesday and Sunday, so it’s a little bit less of a setup just because those markets are newer. Wow, I’m so impressed. You both have small children. Yes. Yes, we both have three. And then Coley, shortly, will have a fourth. Yes. And how do you deal with managing like time working on this business because it’s like a lot of moms, for example, who have businesses, you know, they do it from 8:30 to 3 when their kids are in school and then they’re done. And you guys have these big productions that you’re putting on. Well, we have a lot of help. So during the year when it’s not market week, we are in the office 3 days a week and it is, you know, usually like 9 to 3. We pick up our kids and still be a mom. We transition from business owners to homework slaves after school. To all the sporting activity. We call in all the big dogs. Our whole families come out and help during market week. And our moms and mother-in-laws watch the kids while we’re setting up. So market week is a little stressful. We’ve started bringing our older kids to help during the market. And it’s been so fun. My son wants to quit school and just work for Junk in the Trunk Vintage Market. But they see the vision and they’ve me like “I think I can do anything because I’ve watched you run your business” which is really fun. I think that that is one of the best things. For example, I work with my husband, we have a daughter. She sees everything we do. And she sees the boring stuff, she sees the cool stuff but she sees that it’s possible. It’s not a mystery to her. Right. And we don’t do it all. I mean, there’s things that we sacrifice to do our business. I don’t cook for my family, we order out all the time. We have help. It’s definitely all hands on deck, but I wouldn’t trade it for the world. Wow. And what’s it like for you guys now? How many years? Eight years in, you said? Working together and then also working with one of your husbands, what is that like? You talk about working with your husband first. Well, I love working with my husband. And I know most people wouldn’t be able to do it but it works really well for us. My husband came from the financial field and tax accounting. So he was literally gone all the time, all night long, like we would barely see him. So I think I am just so appreciative now for his flexibility and to be able to work with him and see him all the time. So I’m just very thankful for that. Had we not had the other first, it probably would be a little different. But I don’t know, it works for us really well. I mean, definitely, as with any partnership, there’s a lot of give and take, and we have to take turns giving and taking. All very strong personalities. So sometimes that’s more difficult than others. But at the same time, we all kind of have our things that we work on. Then we literally three days a week, we’re in the office together sitting at one big table. And so all three of us and it’s a lot of communication, just texting and emails, and just being completely open and honest with what we’re dealing with each day. And we have three staff members that we also manage that have come on board with us. So that’s also trying to manage them, and they’re all amazing and wonderful, and we’re so thankful for that. And so that’s just another layer. But Lindsay and I too work really well together. I feel like we’ve learned, like she said, there’s give and take and we created last year I think it was the the rating system where we go, Okay, on a scale of 1 to 10, how important is this to you? And we go around and if it’s a 10 for one of us and a 2 for the other, then the person with the 10 gets to make the choice. It sounds silly but it really does work. It really does work. So we always are like “I’m a 10, I’m a 10” or I don’t care, you know, you choose. So it’s actually really helped us kind of prioritize what’s really important, what’s worth kind of fighting for and what’s not. Wow! How do vendors find you and how do you reach out to find people to come to your events? Well, I think especially in Scottsdale, we have been here for almost eight years now, so we’re pretty well established and we don’t have to do too much of going out and searching for vendors anymore. For the most part, they come to us and are interested in our events. And we actually have a wait list. A really long wait list that we’re trying to get through which I feel like is more stressful than trying to find new vendors because everyone wants… And then we have amazing vendors that are waiting and waiting and waiting. But we don’t have much turnover, which is a great thing; however, it’s harder to get new vendors in. And we’re maxed out in the building we’re in, so there’s no room to expand on some level in Scottsdale. So, you know, it’s the good and bad. But in California, I mean, we’re we’re constantly looking for new vendors. A lot of our best vendors come from word-of-mouth from other vendors. But we spent a lot of time on Instagram and Craigslist and Etsy and, you know, constantly just searching for new vendors as well. Because we do like there to be fresh new vendors and items and people. Like, we like the vintage items that come from all over because it does add a variety. And every vendor sells better that way as well when there’s, you know, not 10 people selling the same exact thing. So it’s definitely, you know, it has taken us time but we have an awesome group of vendors right now. And they come from all over, like Lindsay was saying. We have Chicago and Mexico and New York and all over… I already said New Mexico. A ton from California that come to Arizona and then Arizona people are going to California. So it’s just a great mix of you get a real variety of items. And will people like fly out from New York to come to be a vendor? Well, a lot of the vendors drive because they have to carry all their stuff. So like with the guy from Chicago, I think, did a 3-day track down here with a two-ton trailer or something, I don’t know. It was so heavy with all the goods and they go picking in barns in Chicago, and get the old shutters. They tear them off the barn walls. Wow. And how important given that you’re like a physical market, how important is social media for you guys? How important is social media for an event business? Oh man, it’s huge. I mean, especially like it being such a visual thing, I mean, social media, but also our markets are so visual. I mean, that’s what it is, you’re shopping. So, I mean, our business started when I felt like Instagram was really starting and taking off on some level. And so I feel like largely, we grew the way we did because of Instagram. It was taking off at the same time and we started Instagram. But we picked it right up and it has definitely, you know, been a huge factor in our business growing. And how do you use it to grow your business? How do you use Instagram for your event business? Honestly, just posting. So most people follow us so that they can find information for the market. So they may find out about our market, they follow us on Instagram, so that they’re the first to know when the dates are, where the locations are. Yeah, I would say. I mean, we’ve always really focused on being consistent on especially Instagram, but we use Facebook and Instagram for the most part. That’s the only social media we post stuff. And Facebook has turned to a lot of like paid ads and we do a lot of promoting for our event pages and stuff like that. But Instagram is more of just Lindsay and I post every single day. Non negotiable. Just at least once a day. And so the consistency over the last eight years has built us this huge following and we’ve retained all of our even like, original followers, which is amazing. You have a ton. How many followers do you have? Or at 98. We’re not quite there. We’re so close. That’s amazing. And so, are you using Instagram stories? We are. It’s actually something we’ve been really working on trying to do more of. We go back and forth. Yeah, or informational site. We actually work on our personal ones as well and so we encourage people to, like, if you want behind the scenes, like follow our personal accounts and that will show you kind of what our daily lives are. Then we keep our main Instagram as more informational. If we just do stories, it’s posting what the vendors are bringing and sneak peeks of the market and stuff like that. And what are your personal Instagram accounts in case people want to follow you? Mine is just my name ColeyArnold. Okay. So that’s so interesting. So predominantly then, for you guys, Instagram is a way to let your community know like the logistics. Yeah, yeah. It’s very informational. I mean, it’s an easy way to get information out about the markets. And, you know, even I think, which we have found, that people really enjoy is just then how people are styling like the things that they buy at the markets, which is always really fun. How do you use your Instagram accounts for your business? So we also like to use our account a lot to just show how you can then use those antiques and fun things that you’re finding at the market in your own homes. And that’s a big part of it. Facebook, we use. It’s a lot of just purely informational. It’s like, basically the events, event posts and getting out the details because I feel like that’s what people want more on Facebook. And we found that people really they don’t want to… I don’t know if it’s laziness or just the instant gratification, but we have this website that has all the information and people will go to Instagram or Facebook first to ask all the questions, so we found that that’s where they like to get their information. Yes. And they want to communicate with you on the social networks. Not going and searching for your email address on your website. Yeah, absolutely. And so you mentioned, are you running ads on Facebook as well? We do. Yeah, we do some ads. A lot of our marketing money is through social media. We found that we’ve hired people in the past for marketing and we found that really, social media is where our demographic and our followers are. And so spending the money on social media through Facebook and Instagram has been the best resource for us. Yeah, for our business. It’s definitely been the most beneficial way for us to the most bang for our buck with where we’re spending money to advertise. And unfortunately, now on Facebook it’s like, no one sees it unless you pay for it. That’s definitely changed a lot. But we find value in especially our event pages, we do spend a lot of money on promoting those because that has all the information people can RSVP and saying they’re coming and it sends them reminders and comes up in their feed. So it’s definitely a good place for us to advertise. And have you set that up? Do you hire somebody to run your Facebook ads and your Instagram ads? Got it. Okay, so he’s the ad guy. Are you putting lots of money toward ads? We actually have been really lucky. I mean, we definitely spend some money but we have not had to spend a ton of money in advertising because again, our market is an experience and so people come and then they tell their friends and their friends come and then they tell their friends. So a lot of our growth has been through word-of-mouth. We’ve talked to companies that spend $20,000, $40,000, $50,000 on advertising and we luckily have not had to do that. Well. And until the last really like two years, we didn’t have to spend any. We didn’t spend any money on advertising. But now I feel like social media has changed a lot and so we do have to spend money. But that is where we spend it is on social media, for the most part. That’s amazing. And what I love is how you guys kind of found this, found a need and have gone toward it, you know. You were mentioning … well first, I have to stop for a second, which is, so we just moved to Austin and I am decorating and stuff. What are the three trends you’re seeing right now in terms of vintage? Well, first of all, you need to get to Round Top because you’re so close. I’m actually very jealous that you’re so close. Lindsey’ s husband sold there a couple years ago and then we’ve been there twice to shop. And it’s an experience in itself. You will find some amazing things. But one of our favorite things and I don’t even necessarily say it’s a trend because trends go in and out. And I think this is kind of a long-lasting here-to-stay. But when you can mix old pieces with new pieces, it really gives your home character and depth and this warmth that you just can’t get when you go to a store and buy all new furniture. So finding pieces that you’re comfortable with, like Lindsay has some vintage couches that are amazing. Some people are very anti-vintage old couches. So finding your comfort level in the vintage thing. So if it’s maybe just vintage books that you’re okay with, or suitcases as a side table, or a big trunk as a coffee table, find those key pieces that you’re comfortable with having those vintage pieces. Maybe it’s something that grandma left you or a family heirloom. But those pieces that you can bring in that have a story. They’re old, they’re worn, they have character, those are what’s going to really bring warmth and character to your home. And I think that what goes with that, that we always say too is like, when you’re out and shopping and there’s a piece that makes you stop and like you absolutely love that piece, and you’re like, “I don’t know if that’s quite my style,” it’s outside of your normal realm. But if it’s a piece that you really love, buy it and put it in your house because you will find a way to make it work into your house if it’s something that you really love. Yeah, the labels of your style. I think give yourself the freedom to just put the things that you really love in your house because that’s what will make it feel like a home is, you know, how you respond to the pieces that are in your house. Oh, I love that. I love that. That’s very empowering. “One thing David and I talk about almost daily is how hard technology is today, especially if you’re an entrepreneur, if you own a shop, if you’re a blogger. And we think about that when we build MiloTree. We want it to be easy. We want you to be able to install it in under three minutes, to trust us that that everything is handled on our end so that you can spend your time doing all the other stuff you need to do to run your business. If you are trying to grow your followers on Instagram, Pinterest, YouTube, Facebook, grow your email list, and if you have a Shopify store, to get people from your blog to your shop, I highly recommend you check out MiloTree. Head to MiloTree.com, sign up. You can install it on your site in under 3 minutes. You get your first 30 days free. We are here to help in any any way we possibly can. And I really think you’ll be amazed at how easy it is. And now back to the show. Do you guys set yourselves up as taste makers and how do you then share that in your business? And I think it’s kind of naturally happened that way. Both Lindsay and I love to decorate our own homes and we have a passion for it. So it’s something that we do and we share just because we love it. And so, we of course get all the messages. Where’d you get that? Where’d you get that? And so we share those things not to make money. We don’t have affiliate links. It’s just more of like, this is what we love, this is what we’ve done. And a lot of pieces don’t have… you can’t get another one because they’re vintage. One of a kind. Like, sorry, you can’t find that. But yeah, we definitely I feel like have such a passion for it, so we naturally share it. But we didn’t set off to try to be these know-it-all vintage queens. It’s just something that we love and we like to share, you know, when we redecorate a space. We’re starting a blog series now that’s kind of just showing people like it doesn’t have to break the bank to decorate your space or create your home and make it feel like you. You can do it on a budget. And we’re going to try to show you kind of ways to do that. Coley’s living in like a rental house right now. I mean even in a rental house, you can still make it feel like a home without having to totally redo everything. Right. We moved. We sold our house. We remodeled our house and lived there for four years and we’re featured in magazines and it was just really great. But we sold it in June and we couldn’t find a house that we love to buy again. So as the baby was approaching and getting closer, we’re like, we need to we need to move into a house. Any house. So we rented something and it’s this cute little 1950’s house that hasn’t been redone but has brown carpet. It’s nothing that I would pick, but I’m just showing people like, okay a lot of us are not in an ideal perfect gloried farmhouse that’s been remodeled top to bottom. And how do you still make, you know, but your personal touch on this home that maybe you don’t have the freedom to paint the walls or knock down walls or put new flooring in? So we’re going to kind of share that too on our blog platform. And again, you don’t have to go spend a million dollars at Pottery Barn to make your home feel comfortable to you. You can do it on a budget, you can do it with really fun vintage things and then mixing. We love Target. We love the big box stores too, but just mixing I think is the key of going don’t just go buy a whole room from Pottery Barn. Or feel like you have to. Yeah. Or feel like you have to because most of us can’t. So how do you decorate and get that feel, but decorate on a budget. Okay, so I was looking at your blog. One of you, I love this idea, I’m going to steal it. You’re using like that pink kind of mesh on your tablescapes? I love it. Where did you find that? Well, it’s actually just cheesecloth, okay. They’re like on Amazon. And I found out through Pinterest that you can dye cheesecloth and I actually died it with avocado. Sounds very strange. But with the like seed and the skins from… we eat a lot of guacamole in my house. So I discovered that you can actually die things with the seeds and the skin on it. So you soak it in hot water, and then it comes out that beautiful pink color. Oh my God, it’s pink! You never think it, but, you know. Oh, my god! I was like, I am so using this idea. So anybody who’s listening and wants to go see it, definitely go to your blog which is JunkintheTrunkVintageMarket.com or is it just JunkintheTrunkVintage.com? I keep telling her she needs to… It’s JunkintheTrunkVintageMarket.com. She needs to do a tutorial on that. Exactly. That’s why I was asking in terms of you guys as tastemakers because you do such beautiful stuff and I was wondering if that was a direction that you were thinking of moving in or kind of what your thoughts were because I’m like looking up to you guys as tastemakers. Oh, thank you. Well, I think we just love it. Again, it’s just a part of who we are and that we just like to share the things that we love. So we both we both love having people in our homes, and so that’s an easy way to, you know, that’s a part of who we are and what goes on in our houses. You mentioned that you have a kind of women’s network group. And can you share what that is and like what you do? So when we started, I’m going to talk eight years ago, one of the things that we felt was missing from the community and the the marketplace was a creative women’s entrepreneurship kind of networking group. Lindsey and I would go to a bunch of networking in the beginning just trying to meet people and spread the word of our market. And we found that a lot of the networking events were run really poorly. No one introduced themselves. There was no purpose. The heart behind it was great. It was like, let’s gather as women. But then you got there and you chatted with the person you came with and then you laugh, not actually networking with anyone. Or you exchanged a business card and then you leave with a stack of business cards. But you don’t even remember the person who gave you the card on some level. So our heart behind it, and it took us eight years to actually start it, again there’s never enough time, money or energy, but we just decided to do it this year and it’s been such a blessing to both of us. So we meet. It’s called The Foundress and we meet once a month here in in Phoenix, and the relationships that have been built and the connections that have been made, the collaborations, it’s just really incredible to watch. And one of our goals is just really to encourage women because I think as an entrepreneur, especially a lot of people who don’t have partners, you’re working by yourself. And a lot of times you’re working either at your house or at Starbucks, and it can be isolating. We also struggle with social platforms, product sales, and all the things that you start to question going, “Am I the only one dealing with this?” And you start kind of going down that spiral. We really wanted to create a space where women could come and just feel encouraged. One of our biggest platforms is like share your failures, share your successes, and we want to come alongside you whether you’re feeling like you’re failing or you just had a huge win in your business. Either way, we’re going to be there and cheering you on. I think a lot of women are not just afraid of failure, but afraid of sharing their failure because we tend to think that we need to be these super women and we need people to think that we have it all together. And that’s just a big lie. None of us do. And how many women are in this? We have about 80 members currently. And we just launched in August. Wow. Is this a way also that you’re thinking of monetizing or is this really just come together and talk about stuff? Well, it definitely is. I mean, again, as with any business thing, we have a ton of expenses with this business. So it does cost, it’s a $45 a month membership fee. And that we rent a room in a hotel, and we offer breakfast and coffee for all the members every meeting. We also do happy hour where they get free drinks and appetizers once a quarter. We’re bringing in speakers every meeting and so that also helps, you know, the funds just help cover the costs at this point. So, I mean, we really want it to be affordable for women because we’re moms and businesswomen, and we know that you don’t always have the money or it doesn’t seem possible. But at the same time, just how much value is in that in just meeting with other women and just encouraging each other. And it really has become such an amazing community and just women meeting together on some level and inspiring each other. Yeah. Being together can make amazing things. What would you say the top two things are that you’re hearing over and over again that these entrepreneurs are struggling with? What are female entrepreneurs struggling with in their businesses? And that’s just a big lie that we let ourselves believe and it’s not true. Women are scared I think to ask, or to even like voice that feeling like that you’re the only one because I think even like some of the women… So we meet and we have a speaker but then at the end, we meet around like round tables and so we break it down a little bit so you can go a little more in depth and have a real conversation. The uniqueness of this group is there’s a lot of women who are just starting are about to start a new adventure and then there’s women who have been doing their business for 10-15 years. And all of them learn new things every meeting. So it doesn’t matter where you’re coming from or what your experience is, there’s something that you can still walk way encouraged and uplifted and also learn from each other. And one of the things we’ve noticed is that when you’ve been in business for a long time, like we’re at eight years, you kind of get tired. A lot of times it becomes monotonous like, okay, we’re working, we’re working, we’re working. And we’re like, “Okay, we sort of know what we’re doing now.” And I have to remember that we’re excited too, you know. How lucky we are that we get to be in our pajamas or what, you know, And again, can it be lonely? Absolutely. Can you feel like, Oh, you’re the only one facing this. And other people don’t quite, you know, the moms here in Austin don’t quite understand what I do and so it can feel somewhat isolating. But, it’s also I think so cool. Right. And I think one of the biggest advice that Lindsey and I tell women is you have to get connected because it can be isolating and it’s hard work. When you’re an entrepreneur, you hustle and you don’t have a 9 to 5 job. You have a 24 hours a day, 7 days a week. It doesn’t stop, your brain doesn’t stop. And so I’m finding people that are like-minded as you and that you can share something that was a huge win that weekend, they cheer you on or you can share something that’s hard. But even if it’s through social media, like we’ve met some amazing incredible women through social media that are like our encouragers and support, and we’ve never met them. Or people who are in your community like a founders group. Or something where you can connect and have that time that you set aside for yourself that’s only yours. and you can really focus on kind of filling your tank and being encouraged because it’s hard. What we do is hard work and and it is lonely. I mean we’re lucky to have partnerships, but not everyone does. Or is it, you know, like, “Would you be interested in that?” Like, just to be able to have that just kind of bounce ideas off of here and there is just so important just to be able to talk. We need to talk. What do you think makes your partnerships so successful? So to an entrepreneur, you’re looking, “Maybe I could have a partner in this,” what would you say people should look for? What makes your partnership so successful? One of the things we always say is just make sure that you’re… like Lindsay and I balance each other out. We have different strengths, but our vision and our passion is the same and it’s aligned. So finding someone that maybe compliments you in different areas. So if you’re weak in an area, looking for someone who has that strength in that other area. But just going “Okay, I know her strength and I’m so thankful for her strength, because her strength is not my strength.” And so if you can really focus on that, then that’s where you go, “Okay, I don’t want to do this without her,” because that means I would have to do what I’m not good at. And what are your strengths? How would you define them? Gosh. Well, so here’s a very easy one. Coley is very outgoing and I am not outgoing. I am much more administrative. Like, I handle a lot of the emails and communication that goes out. But yet, Coley is more outgoing and outspoken and great when we’re in a crowd of people. So we kind of again, we balance each other out in that that, you know, she has no problem walking up to anyone and having a conversation. I’m good once the conversation is started but I’m not necessarily the person that’s going to start a conversation. So I think that’s why we work. That’s one reason why we work really well together. Yeah, and Lindsey deals with all the vendors and communication which I think I would probably murder people if I had to answer all the stupid emails. So I’m so thankful for her. And again, I think if you can focus on the strength of the other person and realize that, Okay, if they weren’t here, or, if I went on my own, I would have to take on that job and that’s not something that I’m good at. And so just then going, I’m so thankful for that in her and it’s just easier, if you could focus on that. And I think that’s true in marriage and in any relationship, like you focus on their strengths instead of their weaknesses. Because I have so many weaknesses. So if everyone was focusing on my weaknesses, no one would hang out with me. So just saying like, okay, here’s your strengths, I’m so thankful for them, and then having that be your focus. And like, everyday, we do communication and just knowing that the other person’s taking care of what they’re supposed to be taking care of, and grace when things come up. Yeah. I will say the unique thing for us is that we really did start and grow this business from like such a very small place where neither of us necessarily had any business background. And so, we’ve learned and had to grow ourselves and the business altogether at the same time. And so that I know is very unique. I think it also has led to us having a great working relationship because our friendship really grew with our business growing as well. And this business is like a joint child. Like co-parenting this child that we’ve made. I so see that. And, again, I work with my husband and, of course, we have our daughter and we have our businesses and they are like different children, you know. They have different needs and they need different kinds of attention. Sometimes more needs than your actual children. Exactly. That’s a really good analogy. So what business tool do you guys use to manage your business that you can’t live without? Okay, so I am not a I’m not a business tool person. I’m very like anti, and Kevin is very opposite. He is very like I want spreadsheets for everything. I always roll my eyes and give them the hardest time. However, he just got us hooked on Monday.com and I do have to say it’s changed our lives. So we can always look at that and go “Okay, where are we at on these three things?” And we know someone’s either working on it or getting it taken care of, or it’s been done, or it doesn’t have my name on it so I don’t have to worry about it. It’s just a really great organizational tool that we use for all of our businesses. I love that. I’m going to go look at it after I get out. Okay, what are you excited about right now? I know there is a new baby coming and all of that. But what is getting you guys juiced up? Well, I mean, we talked a little bit about The Foundress and I think this is kind of our new little baby at the moment that, you know, we just started in August and it’s just really starting to take off. And so it’s been really fun and exciting to just build that community. We did just have a happy hour last night, so we’re kind of on that little bit of a high. But, you know, I think just meeting with other women like that and just being able to create the space where women feel safe and feel comfortable to come and talk and just encourage each other has just been really fun. Feel inspired and encouraged as well. I know that that’s been just really fun for us the last couple months. And just a little something different. Like, the markets are fun and we love them. This is kind of our little off-season, if we have one. So we’re coming up on our next big one here in February, which is also very fun and exciting. But it’s kind of been fun to have this other little side project going on to get us, you know. Again, I think just that like you get in such the mode of just “go, go, go” and you forget about like we have created this amazing thing. We did create this Junk in the Trunk out of nothing. Yeah. I think as entrepreneurs, we fall into this trap of always looking forward, like “Oh, next year I’ll be here,” or, “If only I could grow my followers to here,” or, “If only my revenue was here.” And we forget that we started with nothing. Well, I remember. I mean, when we first opened social media, I remember literally checking my phone like every five minutes and being like, “Oh my gosh, we got another follower.” And I noticed every single one and I celebrated every single one. And now that we have like 97.5 thousand followers, it’s like you kind of forget about those little victories. And so we actually joke, we always take a screenshot when we hit like another thousand. And we said, we tell everyone like “We made it!” you know, because if you don’t stop to celebrate those little victories, like you miss the big victories, too. Completely. We just crossed over for Catch My Party, which is our original site, just recently, we just crossed over a million followers on Pinterest. Because we remember hitting our first I don’t know, 50,000 and how cool that was. And now it’s like, “Oh, okay, so not to take it for granted and not to be so thankful,” because otherwise, again, you can push away every success you’ve had because there’s always more that you’re fighting for. So I completely agree. Okay, so when is your next market coming up? Where is it and how can people learn about it? Yeah. Our next one is in Pomona which is just outside of LA, and it is February 23rd and 24th. Yes. The 23rd and 24th. Okay. And if people want to learn more about you guys, about your business, about The Foundress, what should they do? They can head to our website, which is JunkintheTrunkVintageMarket.com. Or again, follow us on Instagram or Facebook and our our tag is just,yeah, Junk in the Trunk Vintage Market. Wonderful. And we talked about how you don’t want to just use the hashtag ‘junk in the trunk’. Bad stuff will show up. Yeah. Don’t search us by ‘Junk in the Trunk’. Make sure you remember the ‘Vintage Market’, that’s an important part. You’ll be a little shocked. Exactly. They’ll get very shocked. No, I totally get it. Well, I have to say you guys, thank you so much for being on the show. It is, again, very inspiring for me to talk to entrepreneurs like you.